Now when all this was finished, all Israel who were present went out to the cities of Judah and broke down the pillars, hewed down the sacred poles, and pulled down the high places and the altars throughout all Judah and Benjamin, and in Ephraim and Manasseh, until they had destroyed them all. Some of these behavioral patterns were easy to remedy. I simply willed myself to behave differently and it happened. Other behavioral patterns weren’t so easily changed. For years I had fed certain natural appetites in unhealthy ways. These behaviors gave certain levels of comfort, pleasure, and masked some deep soul wounds in ways I didn’t even fathom. With the best of intentions I committed myself to changing the behavior only to find myself, in short order, back doing the same thing I vowed I wouldn’t do anymore. In today’s chapter we read about the aftermath of King Hezekiah’s homecoming Passover festival. He’d invited all the Hebrew people scattered in the region to return to Jerusalem to celebrate the Passover feast which commemorated God delivering the Hebrews from Egyptian slavery. It was a huge success. Revival broke out. The people were humbled and recommitted themselves to the Lord. They repented of their idolatry and went out to tear down their pagan idols. They were going to change their ways! But wait a minute. Haven’t we read this somewhere before? The people repented of their idolatry during the reign of Asa back in chapter 15. And again during the reign of Jehoshaphat in chapter 19. And again during the reign of Joash in chapter 24. Each time they repented, vowed to give up their idols and follow God. Then they find themselves right back in their idolatrous ways. Conviction. Repentance. Commitment. Obedience. Temptation. Disobedience. Oh man, do I get that. Along my journey I’ve battled my own demons in the form of appetites out of control. I’ve found myself cycling around and around and around with these unhealthy thoughts, words, actions, and relationships. I feel like a total failure. Here I am again. Ugh. The cycle is a natural part of the journey. There are lessons to be learned in it. There are lessons that can only be learned in the on-going struggle against our own out-of-control appetites. The cyclical journey and on-going struggle led me on a long slog to dig deeper (multiple counselors and mentors), search farther (reading, studying, friends, accountability, support groups), and to become more brutally honest with myself about my own weaknesses. Plumbing the depths of my depravity led to a deeper understanding of, and experience with, God’s grace and mercy. Sometimes you have to hit rock bottom before you’re truly ready to change. With each failure, each renewed commitment, and each return to the path of repentance it was hard to see that I was getting anywhere at all but in hindsight I can see that this wayfaring pilgrim was making slow progress towards addressing the core issues that lay beneath my surface behaviors. This morning I’m recognizing that the people of ancient Judah were a macrocosm of the human struggle against our human weaknesses and out-of-control appetites. Another call to repentance, another revival, another turn away from what was tripping them up. Somehow I don’t think this is the last time. The cycle of struggle was pointing them and me to a very important truth. I can’t do it on my own. We live in interesting times. Technology, mass media, and communication have given our generation a better “global” perspective than any before it. A major event happens in a remote location on the other side of the world and in minutes everyone can have news, photographs and streaming video of the event thanks to the internet and sattelites. As I read today about God sending out the one angel chariot Zechariah saw in his vision to send “a sense of [God’s] spirit,” I was reminded of efforts being made by many to track where God’s spirit is moving. Throughout history, great movements we’ve come to tag as “revivals” have been documented and chronicled. Huge numbers of people place their faith in Christ, lives are changed, miracles reported and local cultures are impacted. With the use of available technology, some are attempting to chronicle where God’s spirit is moving around the globe. It is interesting to note that God has always referred to His Spirit in terms of the wind. When Jesus poured out His Spirit on his followers he breathed on them. When the Holy Spirit poured out on the masses in Acts 2 it came with the sound of a gale force wind. God’s Spirit blows where it will. 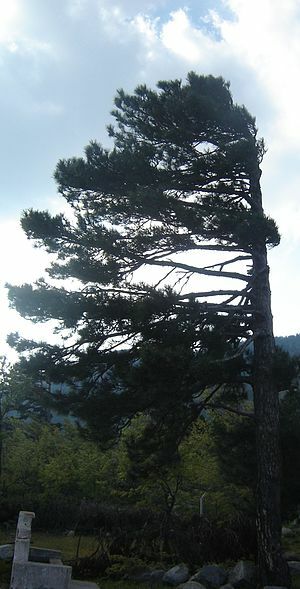 It cannot be seen, but the effects of its presence become obvious to those in its midst and in its wake, like the tree pictured. I’ve been told by friends who follow these things that God’s Spirit seems to be moving in the southern and eastern hemispheres in a big way. Today, I’m praying for God’s Spirit to move into my area like a great tropical depression. Through the journey I’ve been involved in many churches and many different ministries. In that time I’ve been part of many different “plans” to bring about the next big revival and pack the pews with new converts and members. I’ve watched all sorts of different designs and machinations concocted by local leaders and nationally touted gurus. Put tab A in slot B and people will flock to you just like it did in Timbuktu. It never seems to work as prescribed and predicted. I’m not saying we shouldn’t try different things and learn from what has worked for others. At the same time: “You can’t force these things.” God’s Spirit moves like mysterious wind, in His own time and power. You can’t conjure it, you can’t force it, and you can’t predict it. What we can do pray hard, love well, and teach God’s Message faithfully.